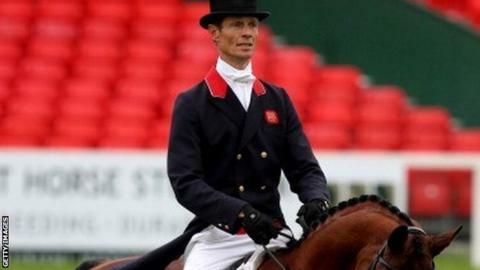 Britain's William Fox-Pitt shares the lead with German Olympic champion Michael Jung after the dressage stage of the Burghley Horse Trials. Fox-Pitt, on Fernhill Pimms, and Jung - aboard Fischerrocana FST - both scored 34.2 points. They top the standings going into Saturday's cross-country stage, with Australian Sam Griffiths (36.8) third. "It is going to be a big day. He might be up for it and brilliant, or he might be green," said Fox-Pitt of his mount. The event, in Lincolnshire, concludes with showjumping on Sunday.